Self-defense is a requirement in the animal kingdom, with copepods, frogs, cobras and other animals utilizing unique protection mechanisms that throw off predators and amaze us human observers, even when the secrets behind some of these tricks come out of the bag. 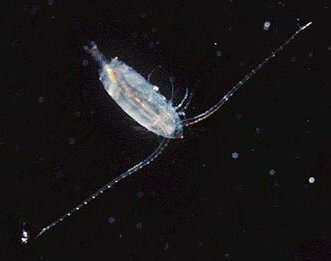 For one-to-two inch crustaceans called copepods, it is a necessity to be able to escape from larger underwater predators such as jellyfish, herring and mackerel. Recently recognized as the world’s most powerful jumpers, these tiny, torpedo-shaped copepods can accelerate as fast as 500 body-lengths per second when escape jumping in the water, raising the question of how something so small can generate so much speed? 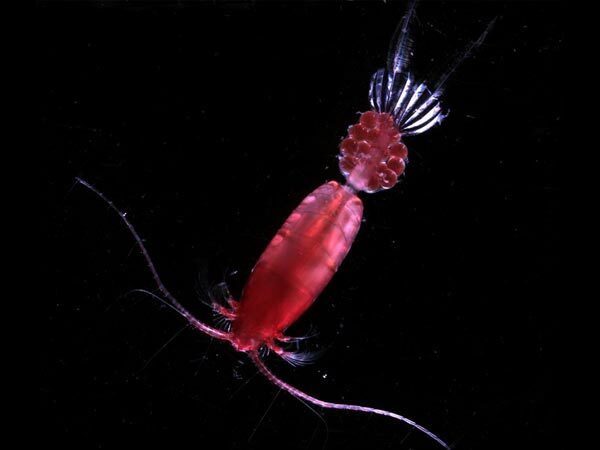 Well, it turns out that copepods have two different propulsion systems – one for jumping and one for swimming – that allow their miniscule legs to create so much power. 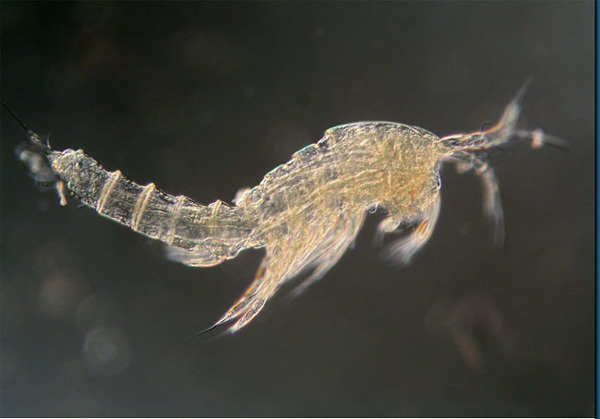 According to recent research in the Journal of the Royal Society Interface, the copepod muscles used for jumping are geared differently than those used for swimming, thus allowing a maximum amount of force in short periods of time. Besides acting as an incredible defense mechanism, this super-jumping ability serves copepods well by allowing them to sneak attack smaller prey. While copepods may be considered the world’s most powerful jumpers, frogs certainly can give them a jump for their money, with some smaller frogs able to jump more than 10 times their length. According to recent research in the Proceedings of the Royal Society B, the secret to frog-jumping abilities lies in their leg muscles, which are extremely flexible compared to those of other mammals. Prior to jumping, frogs situate themselves in a crouching position that stretches and elongates their hindlimb muscles in ways that define the laws of physics. Ultimately, this stretching enables frogs to generate incredible mechanical energy and force when taking off into the air and escaping from potential threats. What may come as a surprise, not all cobras use their venom to kill potential meals or threats; rather, some spit venom into eyes, which proves to be an amazingly effective and accurate defense mechanism. 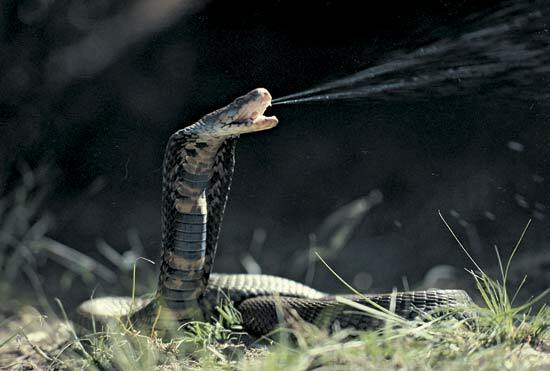 As recently detailed in the Journal of Experimental Biology, researchers studying spitting cobras were perplexed by a few questions: why do these snakes wiggle their heads before spitting and how do they hit their targets with such amazing accuracy ? Well, it turns out that spitting cobras track the body and eye movements of potential threats. 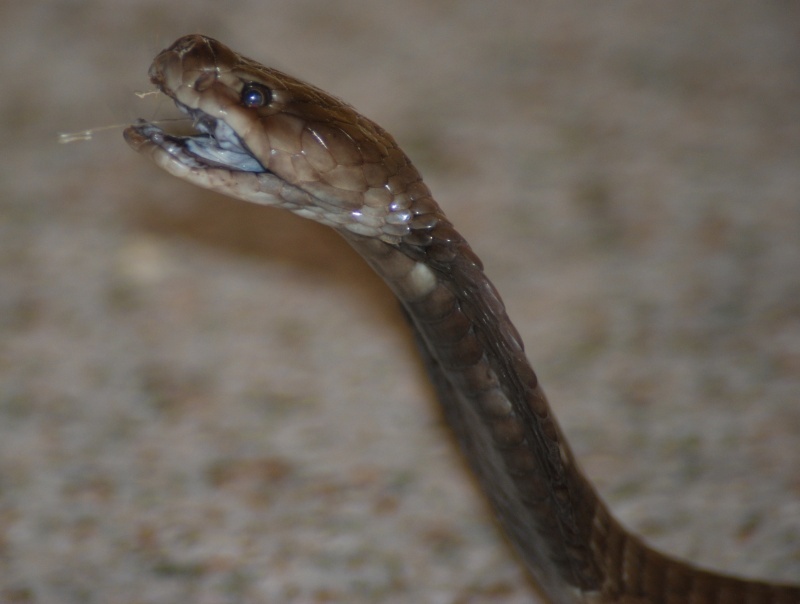 When triggered by jerking head movements, these cobras will briefly restrain from spitting and actually wiggle their own heads in the direction of the threat’s eyes. This action allows them to estimate where the target – the threat’s eyes – will be in approximately 200 milliseconds. With this estimation in sight, the spitting cobras are able to aim and fire with a pinpoint control and accuracy that leaves many foes with burning vision. It would seem implausible that big and potentially bad elephants would be afraid of something as small as bumblebees. Well, it turns out that bees can put quite a scare into elephants, which utilize unique low-frequency rumbling sounds to communicate the presence of these winged creatures. According to research recently reported in the journal PLoS One, acoustic analysis of these distinct elephant calls revealed that they are used to warn other elephants about potential bee dangers and to communicate the need to flee. Especially interesting, the study found that elephants which heard these calls still fled, even if there were no bees in sight. According to researchers, these rumbles could be used by older elephants as a teaching instruction/defense mechanism for younger elephants that have yet to develop thick skins and could be seriously harmed or even killed by a swarm of stinging bees. Referring to the natural production and emission of light by a living organism, bioluminescence is a fascinating phenomenon and self-defense mechanism for many smaller sea creatures, including deepwater jellyfish, scaleless black dragonfish, krill, squid and the pelagic worm. Whether used as camouflage, a warning sign for larger predators to stay away or for another purpose, bioluminescence is still not fully understood – although researchers have been making some ground in recent years. In 2008, the Chemistry Noble Prize was awarded to two researchers for their work around a protein called GFP (Green Fluorescent Protein), which glows green when under ultraviolet light. As just one example, GFP is found in bioluminescent crystal jellyfish, which turn — you guessed it, green — when agitated. While GFP has been aiding jellyfish and other deep sea dwellers for centuries, its applications could even serve as a human defense mechanism in the future – specifically in the fight against cancer.